A stripy crochet scarf, using 5 colours of Stylecraft Batik DK, designed by Lucy of Attic24 to support Big Comic Relief Crafternoon. Any yarn could be adapted for this pattern. 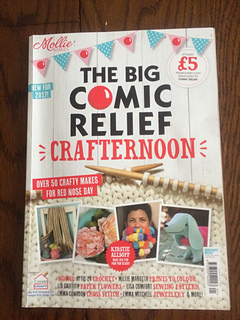 The pattern for this and many other crafts were published in a magazine by Mollie Makes in 2017.